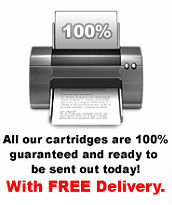 It's easy to buy your top quality guaranteed, printer consumables from us. Simply click your printer type on the left and find your printer. If it's not there or you need any other help don't hesitate to tell us by clicking the 'Contact Us' link above. We sell quality printer ink for every type of Epson, Canon, HP, Lexmark and Brother printer. High volume/business users can also take advantage of our next day delivery on all brands of original and compatible toner cartridges. Eezytrade stakes its reputation on being able to deliver compatible printing consumables and larger toner cartridges to your door as fast as possible, often within 24 hours of ordering. Most orders received before 4:00pm should be dispatched by second class royal mail the same day. To guarantee your order arrives the next day we also offer a first class upgrade or special next-day delivery service (Monday to Friday). Our rapid and efficient response has earned us the praise of many of our clients, and we aim to continue offering this top-level service to our future office consumables customers. There is no complicated navigation, annoying pop-ups, or long forms to fill out. Just click your type of printer and go straight to a list of all printer cartridges for that machine, and choose the right one for you. Another benefit of using Eezytrade is the simplicity with which you can order your printer ink online. All products can be found within a maximum of two clicks from the homepage. We care about the environment. Just send us your old and used printer cartridges in the provided post-free envelope, and we will recycle it for you free of charge! And if you need compatible Canon or Epson cartridges then we supply these as well. Whatever kind of printer cartridge you require, we have it in stock and will get it to your door as quickly as possible. We hope you are completely satisfied with our personal and prompt customer service and most of all, our amazingly low prices for printer ink.